Looney Tunes Golden Collection: Volume 1 is a DVD box set that was released by Warner Home Video on October 28, 2003. 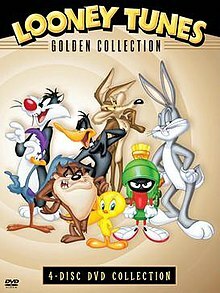 The first release of the Looney Tunes Golden Collection DVD series, it contains 56 Looney Tunes and Merrie Melodies cartoons and numerous supplements. The set won the Classic Award at the Parents' Choice Awards. In Region 1, discs 3 and 4 were also released separately as the more family-friendly Looney Tunes Premiere Collection (also known as Looney Tunes Spotlight Collection: Volume 1). Greg Ford on High Diving Hare", "What's Up Doc? Cartoons 1-12 are directed by Chuck Jones (10 co-directed by Abe Levitow), 13 and 14 by Bob Clampett. Cartoons 1-9 are directed by Friz Freleng, 10–14 by Robert McKimson. In their review of the set, the Parents' Choice Foundation, at their Parents' Choice Award site, awarded the release the "Classic Award" for its high quality in presenting classic material. While cautioning parents about some of the cartoon violence, the review called the set, "solid gold, not just because of the brilliant animated shorts but because of the plethora of commentaries, historical documentaries on the minds behind the madness," and "a true treasure of imagination worth having in your DVD library." The DVD site, The Digital Bits claimed that Looney Tunes had been one of the most anticipated releases since the inception of the DVD format, and noted that the wait had been "long, but in the end definitely worthwhile." The site's reviewer wrote that the cartoon shorts on the DVDs looked, "brighter, much more colourful, cleaner, sharper, and generally better-framed than their Laserdisc counterparts," which, until that time, had been the best home-format for viewing the cartoons. The reviewer noted that the "very generous selection of supplements" were "almost uniformly informative and entertaining." The multimedia news and reviews website, IGN complained about the selection of shorts offered on the first set in the Looney Tunes Golden Collection series. First pointing out that it would be impossible not to leave out major cartoons by selecting only 56 out of the 1,100 Looney Tunes, the review criticized the selection for the omission of Knighty Knight Bugs, an Academy Award-winning 1958 Bugs Bunny cartoon. IGN complimented the restoration of the shorts, but noted that dust was visible in some cases. The reviewer noted that there were more extras than cartoons on the set, and singled out the audio commentaries for praise due to their variety. ^ Release and content information: "The Bugs Bunny/Looney Tunes comedy Hour - The Looney Tunes Golden Collection". TVShowsOnDVD.com. Archived from the original on 2009-01-23. Retrieved 2009-02-05. ^ Lambert, David (2004-04-03). "Site News - 3 TV-DVDs win Parents' Choice Awards". TVShowsOnDVD.com. Archived from the original on 2009-04-15. Retrieved 2009-02-05. ^ "Looney Tunes Collection-Best of Bugs Bunny (2003)". Michaeldvd.com.au. Retrieved 2016-09-10. ^ "Looney Tunes Collection-Best of Daffy and Porky (2003)". Michaeldvd.com.au. Retrieved 2016-09-10. ^ "Looney Tunes Collection-All Stars-Volumes 1 & 2 (2003)". Michaeldvd.com.au. Retrieved 2016-09-10. ^ "Parents' Choice Awards : DVDs : The Looney Tunes Golden Collection". Parents' Choice Award. Retrieved 2009-02-06. ^ Maxwell, Barrie (2003-10-23). "The Looney Tunes Golden Collection". The Digital Bits. Archived from the original on 2008-09-05. ^ Patrizio, Andy (2003-10-30). "Looney Tunes Golden Collection: Nice start, but it's almost all Bugs". IGN. New York: News Corporation. p. 1. ^ Patrizio, Andy (2003-10-30). "Looney Tunes Golden Collection: Nice start, but it's almost all Bugs". IGN. New York: News Corporation. p. 2. Camp, Todd (2003-11-14). "It's Saturday morning all over again with new DVD collection". Fort Worth Star-Telegram. Fort Worth, Texas: The McClatchy Company. Knight Ridder. Greenman, Ben (2003-11-17). "THAT'S NOT QUITE ALL, FOLKS! ('Looney Tunes Golden Collection')(Video Recording Review)". The New Yorker. New York: Condé Nast Publications.